For nearly four hundred years after Malachi, divine silence marked the history of Israel. With the birth announcements of John the Baptist and Jesus the divine silence was about to be broken. The birth stories of John and Jesus have parallels. 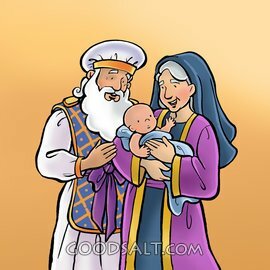 Both are miracles: in the case of John, Elizabeth had gone well past the child-bearing age; in the case of Jesus, a virgin was to bear the child. The angel Gabriel announced both birth promises. Both announcements were received in a spirit of wonder, joy, and surrender to God’s will. Both babies were to grow and become strong in the Spirit (Luke 1:80, Luke 2:40) . But the mission and the ministry of the two miracle babies were distinct and different. John was to be a preparer of the way to Jesus(Luke 1:13-17) . Jesus is the Son of God (Luke 1:35) and the fulfillment of the Messianic prophecies (Luke 1:31-33) . Read Luke 1:5-22. Though Zacharias is depicted as blameless, his lack of faith at the angel’s announcement brought a rebuke. How does this help us to understand what the concept of blameless means for a believer in Jesus? The birth of a son to Zacharias, like the birth of the child of Abraham, and that of Mary, was to teach a great spiritual truth, a truth that we are slow to learn and ready to forget. In ourselves we are incapable of doing any good thing; but that which we cannot do will be wrought by the power of God in every submissive and believing soul. It was through faith that the child of promise was given. It is through faith that spiritual life is begotten, and we are enabled to do the works of righteousness. —Ellen G. White, read The Desire of Ages, p. 98. The miracle of John had a decisive purpose in God’s dealing with His people. After 400 years of prophetic absence in the history of Israel, John did break forth into that history with a specific message and with a decisive power. John’s mission and message was to make ready a people prepared for the Lord (Luke 1:17, NKJV) . He was to be the forerunner of the Messiah, the one to prepare the way for the mission of Jesus. Luke is one of my favourite "readings" in the Holy Bible. It gives me that Hope for the coming of Jesus again to take us home!! It provides me the Strength and the Faith, and to keep His promise to come and take us home!! It's been my guidance, and as a believer in Jesus Christ, the Son of God who is alive today and forever! Each day; I say to my self "If God can handle Eternity, I can surely handle today..."
Everything is possible with the Lord. As our memory text (this week) says; ""For with God nothing will be impossible" (Luke 1:37, NKJV). I am looking forward to this quarterly SS lessons! God bless us all while we're waiting for the Lord! In the case of Zacharias , i learn that our blamelessness is only in Christ , as we see him as a servant of God , a priest in the order of the earthly sanctuary , he can't believe that God can give them a son in their well advanced years , he lacks faith . We have faith and are saved only through Jesus , our goodness is nothing but filthy rags . Indeed is I'm also looking forward to this weeks quarterly. I'm starting to study the book of Luke with more understanding. I love the balance of the above quote from EGW. then she states that it is through faith in God that we experience the miracle. It is not faith that works, it is God that works and it is faith that accepts God's work in our hearts. "It is not faith that works, it is God that works and it is faith that accepts God's work in our hearts." That is a profound and very powerful statement, Shirley, thank you. Amen. God works, faith accepts. Elisabeth and Zacharias were faithful workers in their areas of responsibility. Gabriel chastised Zacharias for his doubt, but in a way the deafness and dumbness was also a way for Zacharias to ponder the experience, and the power of God to give to them a child who would be the forerunner of the Messiah. As he struggled through those long months, it seems his faith became strong and he could rejoice in the blessings bestowed. He came to prepare the way for the Lord hence he is called the "voice in the wilderness" his coming was to show people that Christ's coming was to save them from their spiritual fall. To give them life eternal. not their Physical needs. We have been given a prophet as John was to help us prepare for the second Advent that's sister White. But as others forbade the teaching of John the same is found today amongst us. The lesson Should help us. The message that stood out in my mind as I read this lesson is that we should believe what God says. He speaks to us through his word and we should believe and obey. I wondered if in my own life I have has the Zachariah experience in not trusting the plain word of God and was punished until its fulfilment. How different would it have been for the people if he had believed. Our unbelief does not only affect us; it affects the people we come in contact with. Shellian, I am thinking maybe "punished" is too strong of a word in that context. What I notice is that what happened to Zachariah focused the attention of the people on the fact that something special had happened both when he couldn't speak (Lk 1:21-22) and again when he could (Lk 1:64-66). So I think there was more to it than just Zachariah himself. Apparently, God was moving to awaken a people out of slumber and to focus their attention on the Messiah to come. The text seems to suggest that the "Holy Spirit" and the "Highest" are one and the same. How can Jesus be both "the Son of the Highest" and the Son of the "Holy Spirit" who impregnated Mary? Isn't this evidence that our docrine of the Trinity might be in error? "right" - just helpful for me to understand. The notion of Jesus as the Son and God the Father is important because it provides us with a powerful human metaphor that reinforces the relationship between the divine and humanity. However the Godhead is not a hierarchy. It is three equals working together. I do not see the statement about the Highest and the Holy Spirit as a contradiction. We have many pictures of God, all of them illuminating, none of them perfect. Further, we view those pictures through the lens of our experience. As a result, I have learned to respect the views of those who have a different picture of God than I do. Please read on to verse 9 in Col. 2. Also, steer away from human sophistries so that you will remain settled in your FAITH! There is no one who can truly explain the mystery of the Godhead. We should also remind ourselves that God is not constrained by time as we are. His recollection of the past is clear as the present and so is His knowledge of the future. He has however promised to forgive and forget our sins. To me the whole idea of prophets and prophecy that we have is sometimes upside down and backwards. Luke wrote nothing that the disciples didn't already know. There is nothing in the way of special revelation involved in his writing. However, in writing an account of what he learned from those that were eyewitnesses under the guidance of the Holy Spirit and having his letter that he wrote canonized into scripture makes him a prophet nonetheless. The point is that a prophet is a spokesman for God and the information that is used or the way he gets his information is irrelevant. For instance, even though no one calls Martin Luther a prophet he fulfilled that role and probably should be considered as one. While I say that I also feel that we need to be careful with titles such as prophet because that is someone that God especially works with. Just because a person says something that is true doesn't automatically qualify him or her as a prophet. Look at the many roles Ellen White fulfilled. She wasn't just a seer, her job was much, much broader than that and when she wrote she, like Luke, used extra-biblical materials in giving the message that was needed which is something we shouldn't fret about. Hi Nic as Christians we have to believe the Word of God. We should not be dubious. The Holy Trinity is unquestionable. Could not be an error. Let as think and pray. Heavenly Blessings. Thanks Cynthia, well said. We don't understand everything; the mysteries of The Trinity we will never fathom, even through the ages of eternity. Remain faithful and accept what God has revealed to us. The point that stands out for me is when the angel said to Zachariah ..Ÿour prayer is heard. This shows me that God hears every prayer but He answers in His own time. The time when He sees it fit. Let us never get weary in praying, even when it seems as if God is not hearing. James 5:16 reminds us that the effectual fervent prayer of a righteous man availeth much. The connection from the Old Covenant to the New Covenant is in Luke 1:67-79. 1. Eden Covenant. Genesis 2: 15-17. :a) populate the earth, b)subdue the earth, c)have dominion over the animals, d)care for the garden, e)enjoy the fruit, f)do not eat from the tree of knowledge of good and evil. 3. Noah’s Covenant Genesis 9:1-19. :everything from Adam’s covenant remains. A promise not to destroy earth again by flood. 7. New Covenant Jeremiah 31:31-34. :a)law in their hearts, b)God will have a people, It is called new because it completes all the previous covenants. The Covenant in the New Testament. : Luke 1:67-79 Jesus comes as a baby. He is going to restore Eden. Jesus does it all: forgives, shows mercy, loves, suffers, dies, goes to the Father, He is preparing a place for you and me. Imagine what it would have been like to not have had a revelation from God for 400 years. That was parallel to the time when Israel was in Egypt until Moses was called to lead them out. But unlike Moses being named by the Princesses of Egypt, John was named by God himself. Moses received his true education in the wilderness, John also was educated the same way. Here I have learnt that God was not only particular with the name to be given to the child, but also the manner of his upbringing and Education. Nic. Go and read Col 2:5 it may give you an indication to your question. You may be right, but I don’t find this stated in the Bible. Read the story of the birth of Jesus found both in Matthew and John and tell me: Was Jesus the Son of God the Father or the Son of the Holy Spirit? Read also the promise of the coming of the Comforter found in John 14. Pay close attention to verses 17 and 18.
Who was living with them? Jesus, of course. Who would come back? Jesus. Who would now live in them? Jesus. The transition was from physical presence to a spiritual, invisible one. The Trinity doctrine was manufactured in the third and fourth centuries. Again I don't have a problem with this Nic. We each look at the Godhead a little bit differently. I recognise the term "trinity" is a post scriptural addition and in some respects carries a lot of baggage. Someone once asked me to define the Trinity and when I did, immediately stereotyped me in to one of the standard definitions. I felt uncomfortable with that appraisal because I don't like to think of the Godhead as fitting a prescribed model. In the world of physics which I have some familiarity with we use different models to describe certain phenomena depending on what we want to emphasis. I think we have the same thing in the Bible where the Godhead is described depending on what is important in that particular instance. Don't suggest that I am a modalist either because I think that model of the Godhead is too limited. There are always going to be aspects about the Godhead that are difficult to explain. But we do have a working knowledge about those aspects that are important to our salvation. Yes, we need to believe the Word of God. The problem is that I see in what has been written about the Holy Spirit is not the Word of God, but rather the word of men. I have a question for you. Ellen White told us that before his rebellion, Lucifer occupied the third position of honor in heaven. This means that if the doctrine of the Trinity is correct, then the H.S. must have held the fourth position of honor. Here is my suggestion. Read the Bible with the following premise: that every time Bible writers experienced a visual encounter with the divine, they used the expression “the Angel of the Lord,” but whenever God’s presence was invisible, then they opted for the Holy Spirit phrase.